Why Should I Read… Barry Ween? When you are young, the world is a fantastic place. There are monsters under the bed, fairies at the bottom of the garden, dinosaurs at the park, and grown ups are just too stupid to see it. Every new sight, sound and smell is the first clue to a new adventure that’s waiting to be had, just by you. Essentially, you are the centre of the universe, and it’s bloody great. Then you get old. School gets hard, then you have to get a job, and that gets hard, and then you have to get a place to live, and a car, and a relationship, and life continues to kick the snot out of you until you forget what it is to be a kid. Then, if you’re lucky, your local purveyor of stories will press this book in to your world-weary hands, you will read it and you will remember. 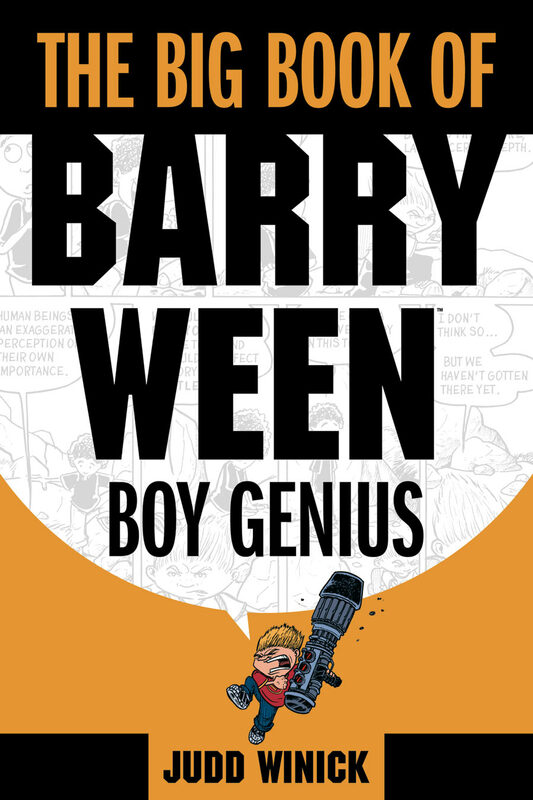 Barry Ween, Boy Genius is the product of the mind of Judd Winick. Winick has received praise from the likes of Garth Ennis, Jeff Smith and Brian Michael Bendis for Barry Ween. He does have direct ties to DC and Marvel having written for both, so it’s not surprising that some of the comic world’s heavyweights have been exposed to and subsequently lined up in support of Barry Ween. So if I’m writing this, what the hell can I say that would persuade you to pick it up if their comments don’t? I am not here to give you sound bites. I am not a creator of blurb. But there really is something I can only describe as magical about Barry Ween. It has the same feel as many kids TV programmes from my youth; a child who the world sees as normal while the viewer sees as special. Barry is the most intelligent human ever, and thus uses his knowledge to invent the scientific marvels from all your standard sci-fi plots. Nothing untoward so far. Barry has a friend and sidekick, who only just understands what’s going on, and only just stays out of harm’s way with Barry’s help. Again, staple stuff from kids TV programmes, comic strips and story books. Barry Ween is drawn like a kids book, it’s very reminiscent of Calvin & Hobbes (which it is unjustly compared to constantly, so ignore that!) or any Beano or Dandy strip ever. But unlike every kids TV programme or book, Barry and his co-characters swear like they were raised in Gordon Ramsay’s kitchen. It’s certainly not gratuitous, and it’s done skilfully and for appropriate affect – less of the “dropping the f-bomb” and more like “shots from the f-sniper”. Either way, this book is certainly taking no prisoners and isn’t apologising either. Real childhoods have swearing, by the way. Real kids discover swearwords and use them like they invented them, as soon as their parents are out of earshot. Winick knows this, and although at first it simply seems like a comedy tool, after reading you realise there’s so much art in the writing, that in fact he’s off-setting the over-the-top plots with some ‘real’ realism. Barry Ween is a wonderful set of juxtapositions, and the real versus the unreal is just one of the most obvious. The second of which is my personal favourite though; there is a real clash of humour and poignancy that makes this more that a good comic, it makes it a great story. Winick is able to show you the funniest moments of a child that’s smarter than everyone else. Things like Barry Ween and his best friend chasing down a stoned Bigfoot intent on eating Barry’s parents because he has the munchies. Winick is also able to give you just five panels that instantly show you the utterly heartbreaking loneliness that is a 10-year-old boy who is the most intelligent being alive. The harsh reality of his situation is stark contrast to the unrelenting savagery of the humour, but somehow both are showcased with equal mastery. It left me with the same feeling you get when shown close up magic – you’re not sure how it was done, by damn it you can’t help but be impressed. So why should you read Barry Ween? It’s a surprising gift of a book. It gives you more than a story. It gives you emotion, it gives you laughter, but I think that most of all, it gives you youth. That’s a lot for a book, don’t you think?